On Friday 26 May, we welcomed the 2017 Reception students into our College community. 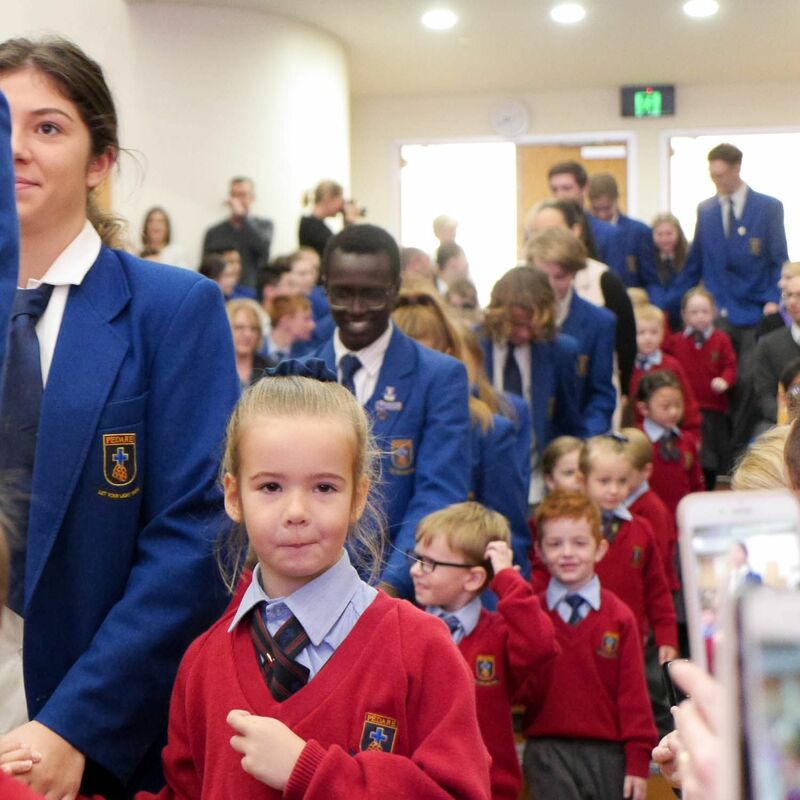 It is one of my favourite One College events, and to watch the Reception students being led out of the Chapel by their Year 12 “buddies” is a special moment. 21 of our 2017 Year 12 students started in Reception at Pedare in 2005. 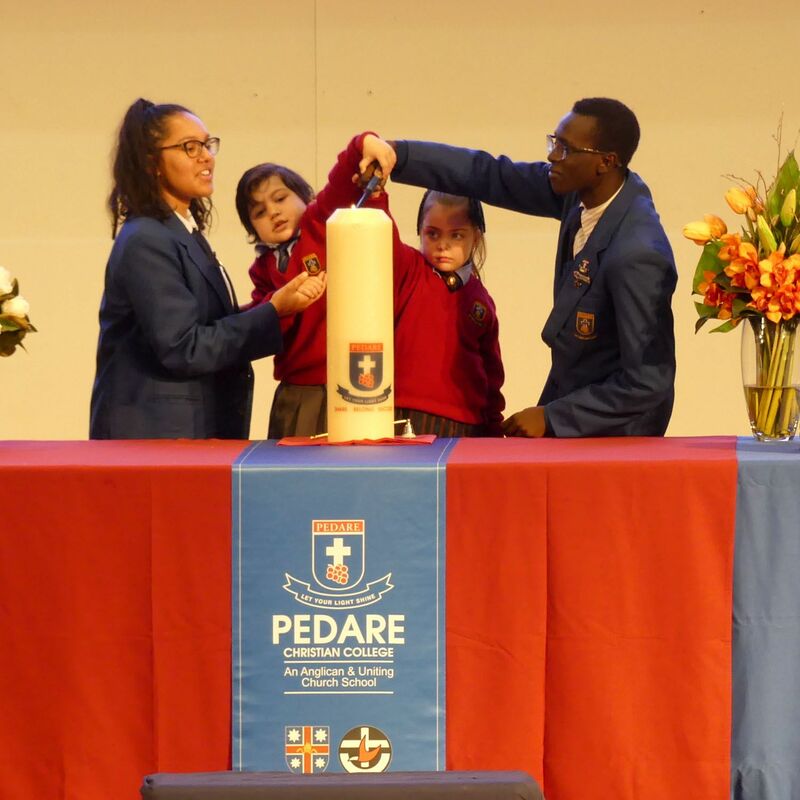 Over the next 13 years, we will work with our 2017 Reception students and watch as they acquire the skills, knowledge and values they will need when they become Pedare graduates in 2029. We wish them all the best on their Pedare journey, and we thank their families for entrusting their children to the care of the Pedare community. One of the most satisfying aspects of being a teacher is to watch the way young people grow and develop as they progress through their school years. On occasions, I am approached by old scholars and asked, “do you remember me?” Often, I remember the face, but too often the name escapes me. Once I have asked for some clues and they tell me their name, and what year they graduated from Pedare, then the memories come back. Pedare graduates always speak very fondly of their time at the College and speak in glowing terms of the support, encouragement and high standard of education they received. To hear their stories and the path they have followed since graduating from Pedare reinforces to me how fortunate we all are to be part of the Pedare community. We are all very fortunate to belong to a College where there is a wonderful sense of community and mutual respect between staff and students. Students openly support and encourage each other and make newcomers to the College welcome and included. The students at the Middle and Senior School campus are currently running a lunchtime event called ‘Pedare’s Got Talent,’ where any student can demonstrate a talent they have, including, singing, dancing, playing a musical instrument or performing magic. After the event last week, one of our staff members was so moved by what they saw, they circulated an email to other staff, and part of that email is reproduced below. 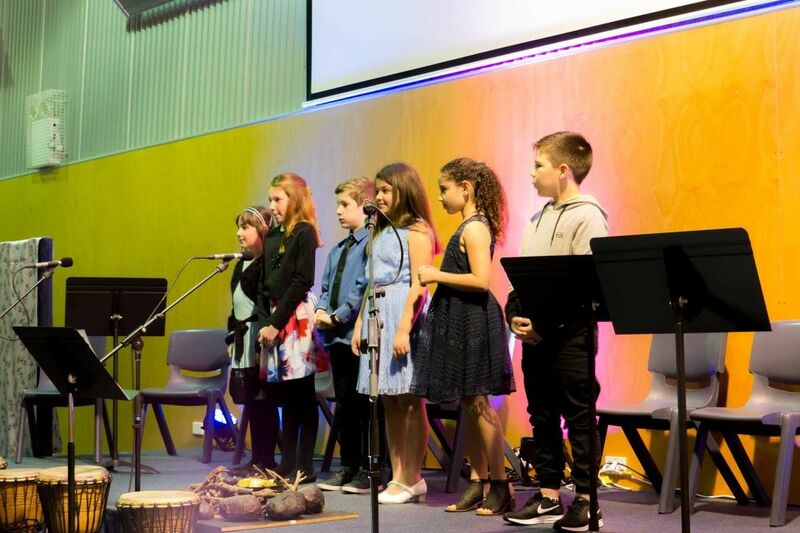 “Yesterday I was privileged to attend the “Pedare’s Got Talent” show in the Chapel and I was so glad I did because it revealed to me very powerfully – we have a cohort of really nice kids at Pedare. The way they cheered, welcomed and supported each performer was truly heart-warming. The audience took part good-naturedly in every act, and even the acts which perhaps would have been more at home at “Pedare Will Give It a Red-Hot Go” were met with enthusiastic and heartfelt applause. We have somehow created a culture where it’s cool to be kind, and this generation is living proof of that. They are a credit to our leadership team with their vision, to every one of us and to their parents. Give yourself a pat on a back”. 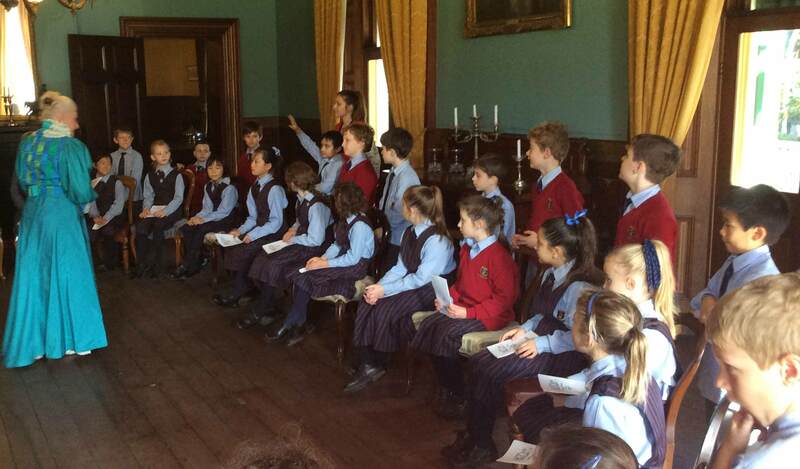 On 26 May, we formally welcomed the new Reception students to the College. This is a very special day – I personally think the most special day in the College’s Calendar. This is because we come together as one to celebrate new beginnings and to acknowledge the contribution of our Year 12 students and to wish them well with their studies this year. Over the past few weeks, I have been privileged to watch the Year 12 and the Receptions come together, and for myself and the teachers, it is a pure joy, to see the smiles, the fun and engagement these students share. 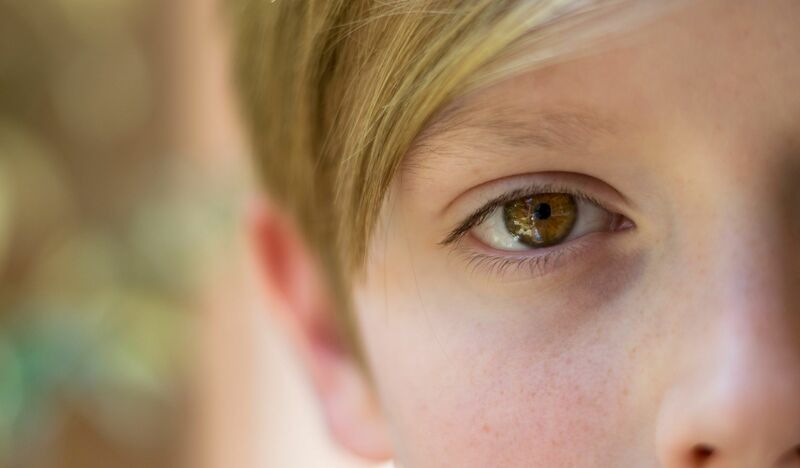 This is not a one-way relationship, we hope our Receptions pass on to their “buddies” the joy of being young, the attitude that nothing is ever that serious and the playground is the centre of the universe. We know in the Junior School that we can learn a lot from the wisdom and experience from our Year 12s and so we asked them for some advice and set them a task to write a letter to their Reception selves which were shared with the whole College as part of the service. One of the things I loved and have missed about being a classroom teacher is finding the right story and then reading it to the class whilst they were on the floor looking up with great admiration. Storytelling is the greatest technology humans have ever created. It is the basis for almost everything in our society, and the way we interact, build, communicate, live and dream all derives from it. Going back hundreds of yers, when gathering and telling stories was something people did as a major communal activity, you would learn that skill formally or informally from people in your circle who were particularly gifted at it. Honing, improving and growing your own stable of stories was an element of your social growth that deeply mattered and was incredibly intricate. I personally love stories, listening, watching, reading and telling and am looking forward to and our next whole school story and Book Week in Term 3. 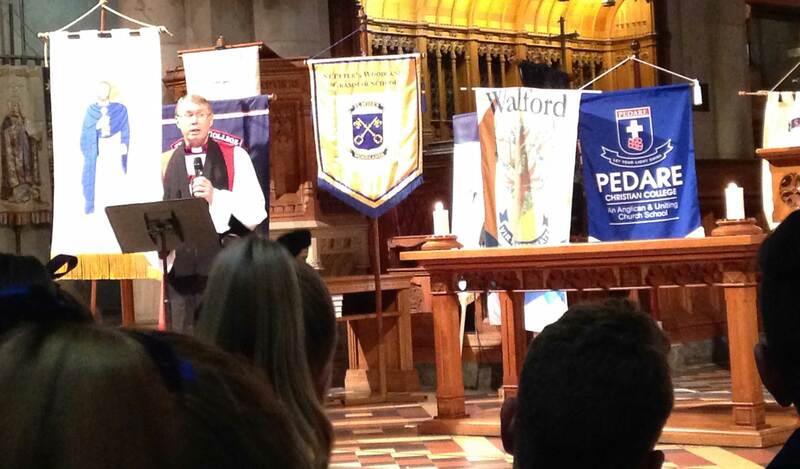 On Wednesday 17 May, I had the pleasure of escorting 2 classes of Middle School students to the Combined Anglican Schools Worship held at St Peter’s Cathedral in North Adelaide. The students represented the College with pride and although we are one school it certainly highlighted that we are all part of one larger community. The students returned very tired from the Year 6 camp but with many wonderful stories to tell. The camp was a success with students enjoying activities such as canoeing, fishing, raft building and hiking. I did see some pictures of students in the water and I am not sure if that was deliberate, but the smiling faces were evident. The camp experience is something the students will remember as a highlight of the year and, although at times challenging, getting through together with their classmates was a real achievement. A big thank you to all the staff who attended the camp. Our next camp is for the Year 9 students who are headed to the Flinders Ranges in Week 2 of Term 3. Recently I read an article about the most important skills that are required for 21st century learning and for future careers. The article discussed the onset and coverage of STEM-related skills and which skills should be highlighted so that students are able to succeed in STEM careers in the future. Problem Solving and Creativity were the two highest on the list. Having content knowledge is important, but to succeed and perform, students must learn different ways to solve problems which will make the difference. The notion of being creative when finding solutions and thinking outside of the box, or from different perspectives will only increase job prospects. Sometimes you have to stand out from the crowd to get noticed and often our assessments in Middle School allow for students to use their creative minds as well as different technology to present creative presentations for assessments. The IB MYP programme offers students opportunities to practice many of the 21st century learning skills such as collaboration and communication. We offer students a perspective on how they are affected in the local community, the wider community and in a global context in the units we teach. The MYP aims to prepare students for a successful future starting with success as they move into the Senior School. I have been impressed with the high number of students willing to get involved in the mid-week Knockout competitions running at the moment. Unfortunately, the Year 6/7 boys’ soccer team were knocked out but the girls progressed to the next round, well done girls! The 8/9 football team played 2 games this week and there are also some netball and soccer teams still to come. Currently, we have Ryan Przibilla (Year 9) playing in the National Baseball championships at West Beach and we wish him all the best. Several other students are trialling for SAPSASA selection in a variety of sports, good luck to everyone involved. We look forward to hearing about the fortunes of the numerous sporting competitions. Week 4 of the term already and the Senior School students and staff continue their involvement in a wide range of activities. In Week 2, the annual Anglican Cup competition took place at Pulteney Grammar. Our students are to be congratulated for the way in which they competed on the day. Our boys’ basketball team was undefeated and quite a few teams lost their matches by the narrowest of margins. Special mention to Nathan Caeran and Joshua Gauci who received the Fair Play awards for basketball and football respectively. Our Generations in Jazz group really enjoyed their weekend in Mt Gambier and performed exceptionally well. We are looking forward to the inaugural running of Flair, on the evening of Monday 5 June. This is a talent competition organised by some of the student leaders of Pedare and Golden Grove High School, as part of a One+ Campus initiative. Students have been auditioning via Pedare’s Got Talent at lunchtimes. It has been particularly heartening to see how well our students have responded to the acts, with genuine warmth and encouragement. It was a pleasure to watch the Year 10 Drama students’ performance of Ruby Moon. It was an evocative play dealing with a sobering subject and the students did a wonderful job in each of their roles. The Year 11 Geography students enjoyed their camp and the Legal Studies class learned a great deal from their excursion to the Adelaide Law Courts. 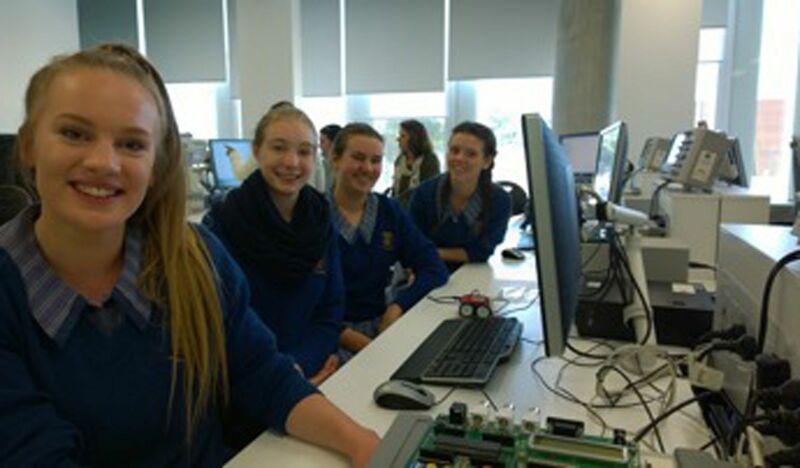 The girls who attended the Women in Defence opportunity at Flinders University shared their interesting and challenging experiences at a recent assembly. On a more sobering note, Year 10 and 11 students have received their examination timetables in preparation for the mid-year exams. This serves as a reminder for our students to remain focused on their studies whilst still enjoying the many alternative learning opportunities on offer. It is important they plan their time appropriately and achieve a balance; and continue to Think Positive. There are some exciting changes coming to the College uniform. A brand new polo top for Physical Education has been designed and we look forward to it being available at Devon Uniforms shortly. The new PE top will be for Reception to Year 12; there will no longer be a different colour top for Senior School. There is also a slight change to the track pants, mainly in the design (inclusion of a zip at the ankle) and fabric, and Devon Uniforms are awaiting the arrival of stock of these also. The new track pants will also be available for all students, Reception to Year 12. We understand that Devon Uniforms are out of stock in some sizes of the current PE top and track pants, so we ask for your patience while awaiting the new items. Other changes to the uniform you may have noticed already are that the gold lettering and stripes in the uniform is being replaced by white, in line with the College logo/brand. This will apply to the Rugby top and bucket hat in particular. 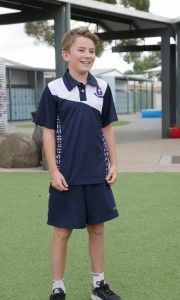 Students may continue to wear the current PE tops until the end of 2019. Parents will be advised as soon as these new items are available for sale. The Physical Education Uniform can be worn using any items in the uniform at any time of the year for PE lessons. The Physical Education Uniform is to be worn only on timetabled PE lesson days. 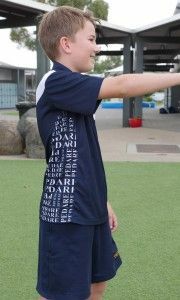 Students must have PE shorts and change or wear them under track pants for their PE lessons. Note: The following has been removed enabling students to wear their shorts all day if they wish. In Terms Two and Three, the Full tracksuit is to be worn to and from the College only on days when PE practical lessons are scheduled. The uniform shorts are an option for all boys in Winter. If boys wish to wear shorts in winter instead of the long pants, they must be worn with the tie and College Jumper / Blazer or Year 12 jumper and with short grey socks. 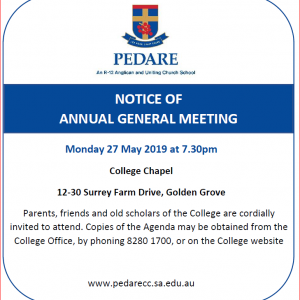 Membership Application forms are available on the College website: www.pedarecc.sa.edu.au New membership applications will need to be received by the College (Board Secretary) by 4pm Friday 12th May 2017, to enable the College to process applications prior to the 2017 College AGM. On Tuesday 23 May, Year 3 had an amazing day at the DreamBIG Festival in the city. 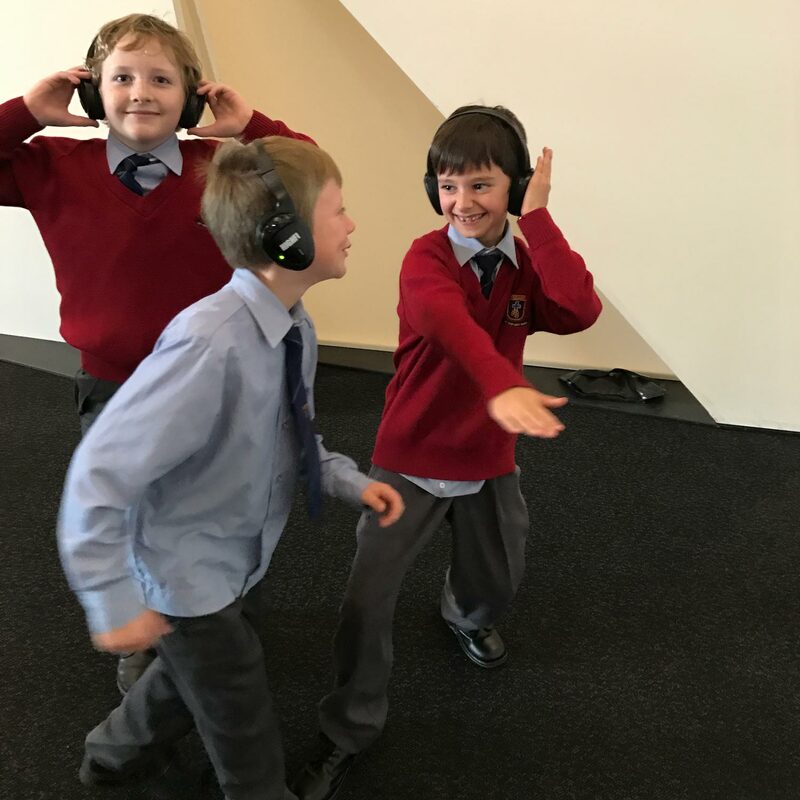 They started the morning with a Silent Disco at the Adelaide Festival Centre. All the children were invited to put on a pair of headphones and dance along to fun contemporary kids’ music only they could hear. They certainly had some ‘unique’ dance moves (adults included). However, when you removed your headphones, it wasn’t quite so ‘silent.’ The children were all singing their hearts out. It was a great, fun experience! 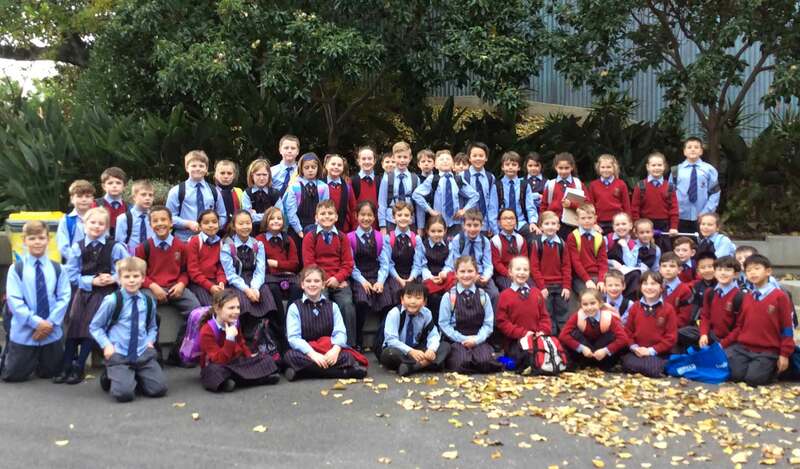 After all their moving and grooving, the children then had lunch at the Botanic Gardens before going to Ayers House for the second part of their excursion. 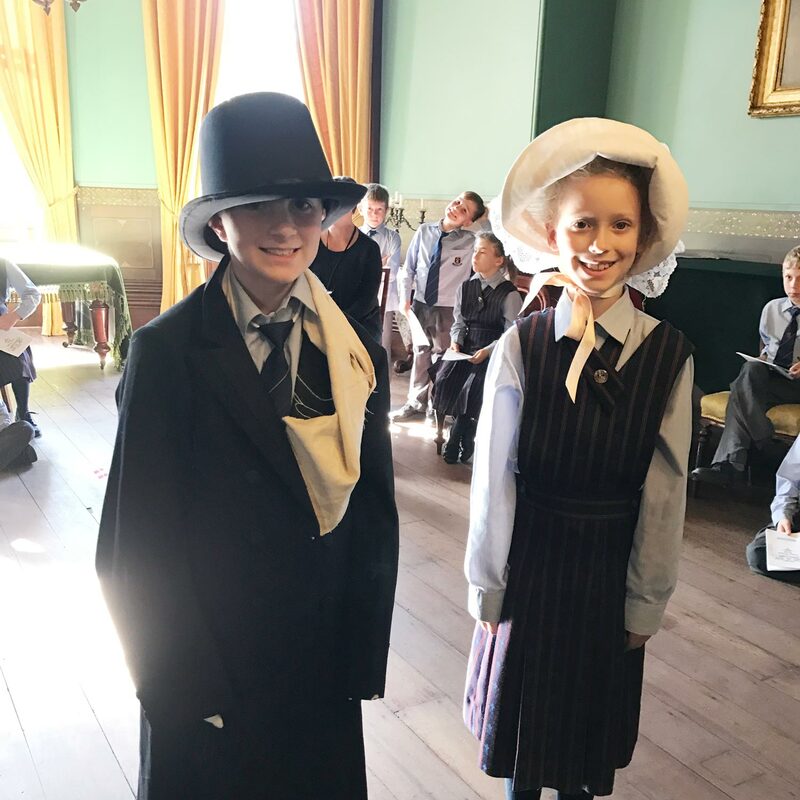 Whilst there, they enjoyed a unique opportunity to step back in time. The children were taken back to a 19th century upper-middle-class home where they took part in an amazing Dancing and Deportment class. They left Ayers House as true Ladies and Gentlemen. Some children even requested more dancing lessons on the lawn outside. 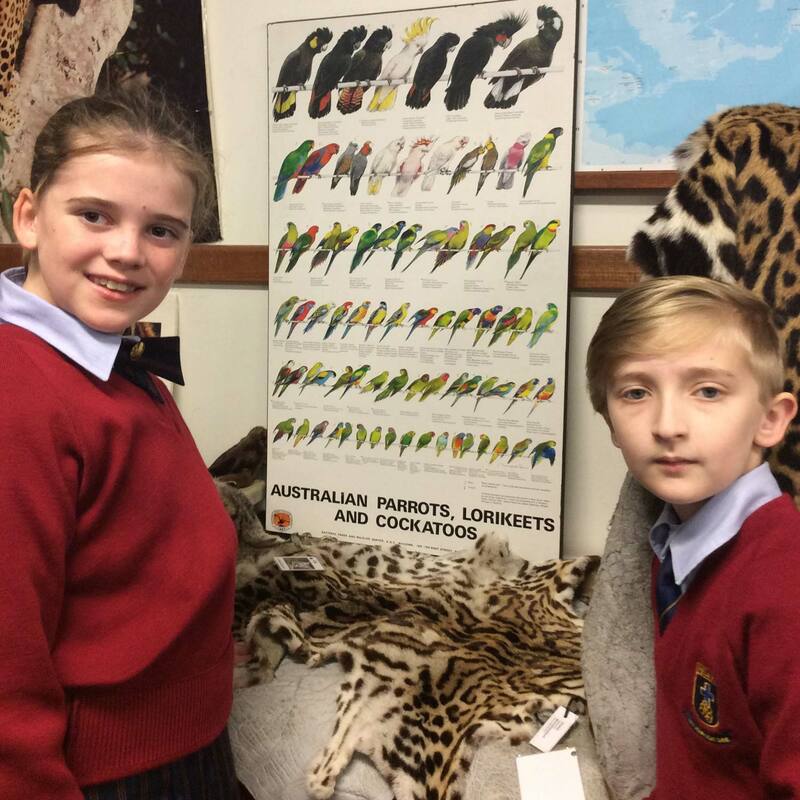 On Wednesday 17 May, Year 4s went to the zoo to provide information about our Sharing the Planet Inquiry unit. We are exploring our central idea “Our personal choices has an effect on living things and the environment”. 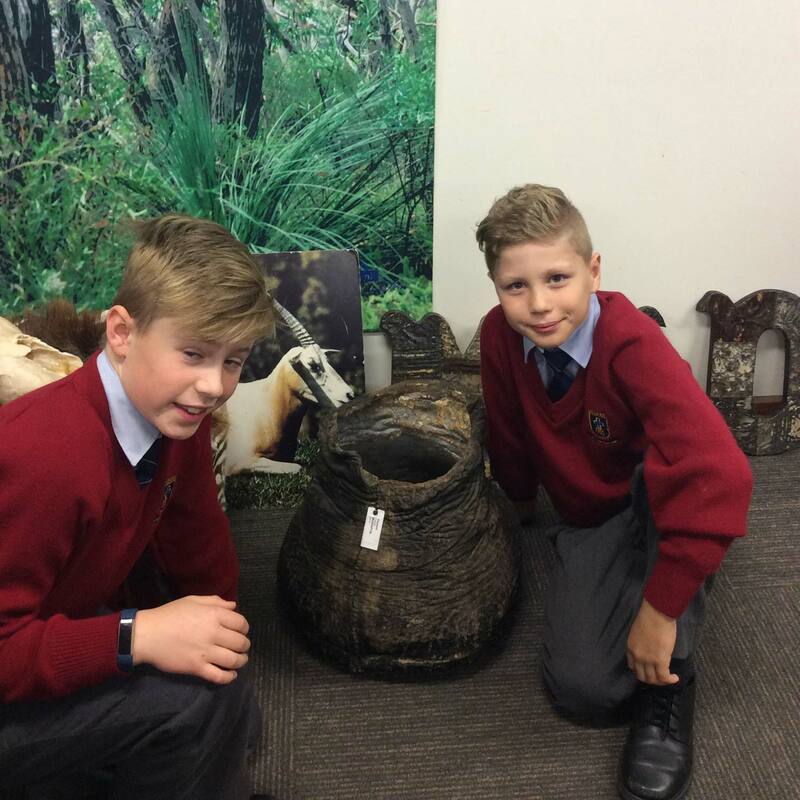 We went to a presentation called “Going Ape” where we learnt about the effect the use of palm oil is having on our environment. We will be producing action plans on what we can do to make a difference to our planet. One example is when shopping for food, look for the labels that show either no palm oil or certified sustainable palm oil used. 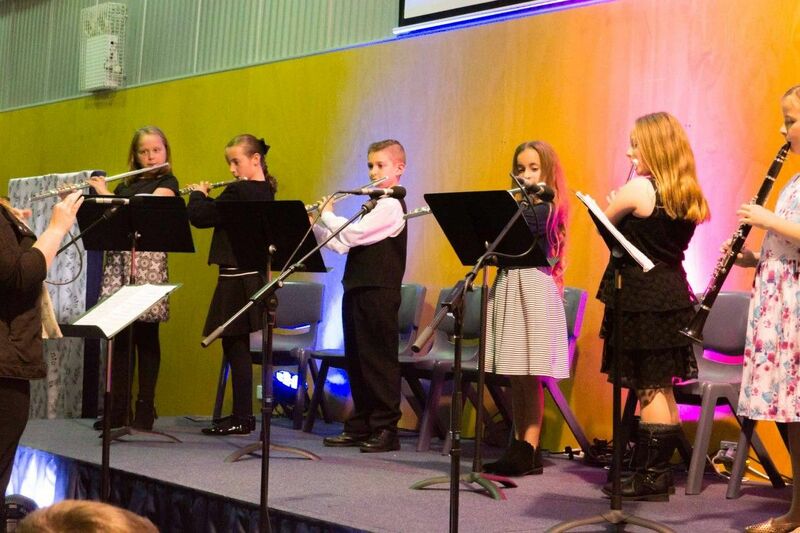 An audience of supportive family and friends came together in Blue Gum Hall on Monday 15 May, for the annual Junior School Recital Night. 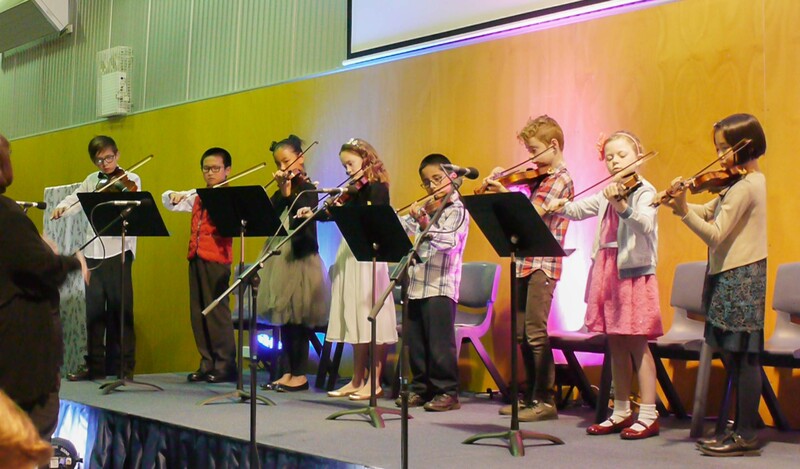 Students from Years 1-5 entertained the audience with instrumental, vocal and ensemble items over a 2-hour period. It was pleasing to see the improvement in students playing since last year and their ability to hide their nerves was outstanding. All students across the Junior School were given the opportunity to entertain their class during ‘Peer Performances’ in Performing Arts lessons the week prior. This was a great experience for students who have just begun learning, as well as excellent preparation for the students who were to perform in the Recital evening. A big thank you must go out to the tutors who prepared their students for performing and who attended on the evening. It was encouraging to note that the evening’s program has grown from 25 performers in 2014, to over 65 performers in 2017, with our instrumental program continuing to grow each year. 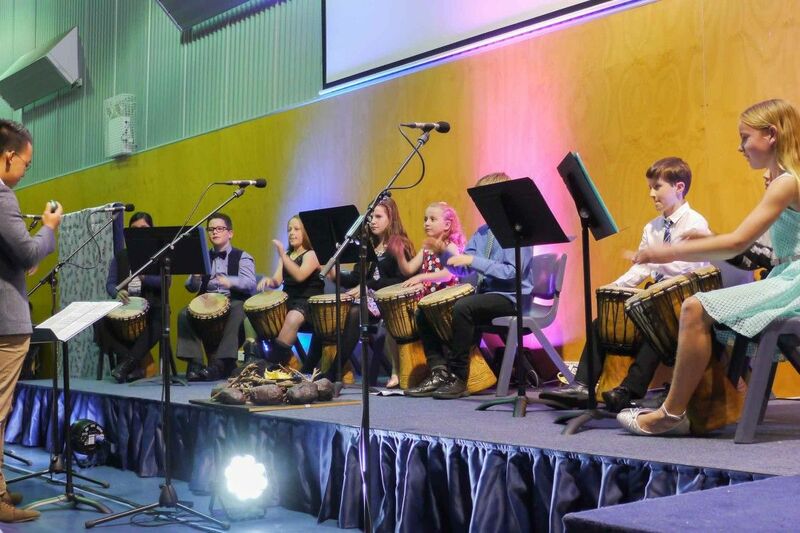 Pedare’s already successful music program, will no doubt continue to flourish with such passionate tutors, parents and staff supporting our creative, young talent. Congratulations to all the performers on the evening. We are very proud of your courage and achievements. Pedare’s Year 6 cohort embarked on a journey to a water recreation facility known as Roonka in the Riverland, approximately 5km out of Blanchetown. The student’s excitement was evident as soon as they stepped onto the buses in the morning with songs being sung and chants being shouted. Any nerves that they had felt in previous days had evaporated. Upon reaching Roonka, students immediately jumped off the bus and began creating their free time games on the small and chaotic grassed area. Tents were erected in record time by the girls, while boys made themselves comfortable in the dorms. The activities of Canoeing, Raft Making, Fishing and Water Ecology were a massive hit with all the students. 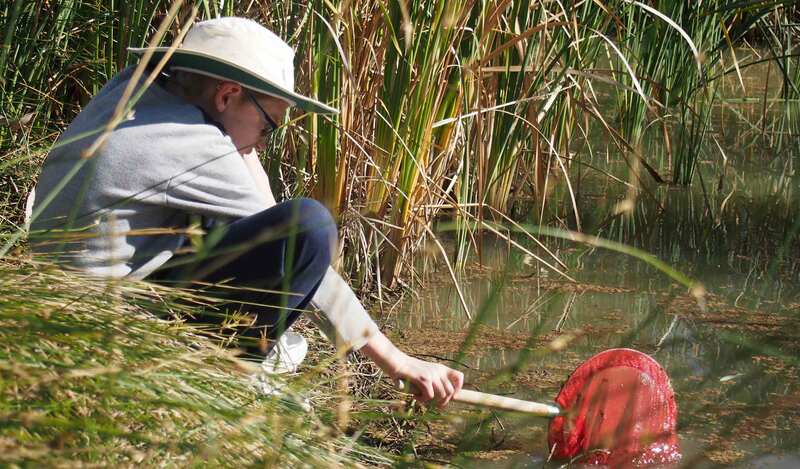 Most notably were instances of students falling in the lagoon while trying to catch their macro-invertebrates, silently floating through the backwaters of the Murray River while listening to the sounds of the surrounds and catching carp…..plenty of carp! Students returned on Friday 12 May, some tired and weary, others excited to tell the tales of their adventures on camp but all had something positive to take away. All in all, the students had a great time with many smiles, high fives and hugs between the students, with many already asking when the next camp is. Unfortunately, not until next year. On Wednesday 17 May, a group of Middle School students from Year 7 and 8 attended the Combined Anglican Schools Service at St Peter’s Cathedral. The theme this year was ‘The Tough Questions.’ This is an annual event which brings together students from 12 Anglican schools, filling the Cathedral with an abundance of colour, noise and creative energy! Our students listened with interest to the new Archbishop Geoff Smith as he was interviewed by students from other schools. One highlight was the time of prayer, when all the students were invited to reflect on the needs of the world as they folded pieces of coloured paper to make a plane. The ‘prayer planes’ were then launched into Cathedral air space. This was certainly a memorable moment for the students and no doubt for anyone else visiting the Cathedral that day! On Wednesday 12 April, a group of Year 11 girls had the privilege of visiting the new Flinder’s University Tonsley campus for the ‘Inspiring Young Women in Defence’ challenge. “Throughout the day, we participated in many inspiring activities, the first of which was riding down to Flinders in a Mercedes that Adele had ridden in just only week earlier! When we arrived, however, as nerdy as it sounds, more fantastically inspiring activities awaited us. First up was cyber-security. We looked at the reasons why cyber security is critical in society, the ways our data is protected from cybercrime, as well as how and by whom cybercrime is perpetrated. We also discovered some unbelievable realities. Did you know cyber-security includes prevention of physical, as well as virtual access to data? 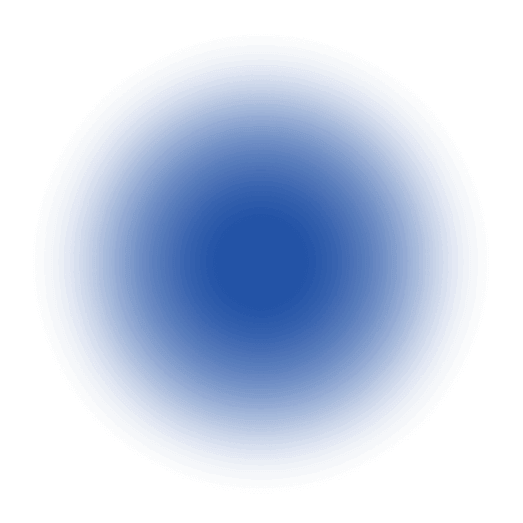 What, would you say, is the world’s largest cyber weapon? We guarantee you wouldn’t say the USB! Then, after some time in the ‘classroom’, we went out and about for some hands-on cyber-security. Our mission: to break into the Flinders Uni building to gain access to data stored on laptops. To our surprise, we discovered we were quite good at it! Watch out IT, we’re coming to get your data! After a terrific pizza lunch, it was off to robotics. We learnt the basics of how to program a small robot and then set to work putting our new skills to use, designing code to navigate the robot successfully through a war-torn village to evacuate and provide aid to civilians trapped inside, and testing our code on a model village. With a few attempts and a lot of teamwork and perseverance, we got past the issues and made a successful robot. We were commended by the supervisors on our ability to overcome challenges, which we have our teachers to thank for. On Thursday 18 May, our Year 12 Essential English students went on a whole day excursion to the city. First on the agenda was to see a play at Tandanya, which was part of the DreamBIG Festival. The play, entitled Gone Viral, centered around a teenage girl, Cassie, who was coming to terms with her father dying of cancer. He had come home to spend his final weeks with his family and Cassie struggled with knowing what to say to him. How could she tell him what was really going on in her life; that she had failed a maths test, and gotten drunk in the park after school, or that a suggestive photo had been taken of her and had gone viral on Facebook? The play dealt with the ups and downs of teenage life, and the struggle to make your parents proud. It was a well-executed and engaging play. Following the play, students participated in a Hidden Treasures walking tour of the city. They followed clues which took them down quirky alleyways and into hidden libraries and bookshops. This tour prepares them for their own instructional writing unit, in which they will compose clues to take their own friends and family on a mystery journey. The students had a great day and are in the process of writing their theatre reviews! 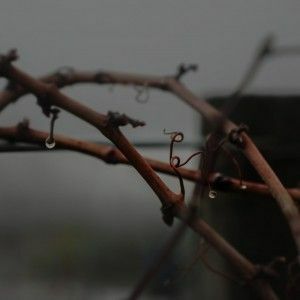 The competition is a good opportunity for students to be able to take professional, high-quality photos on a range of devices they have access to. The group submission from Riya Phillips, Liliana Carletti and Zoe Roshkov, Year 9s. All participants showed creativity through their use of colours, textures, lighting and props. 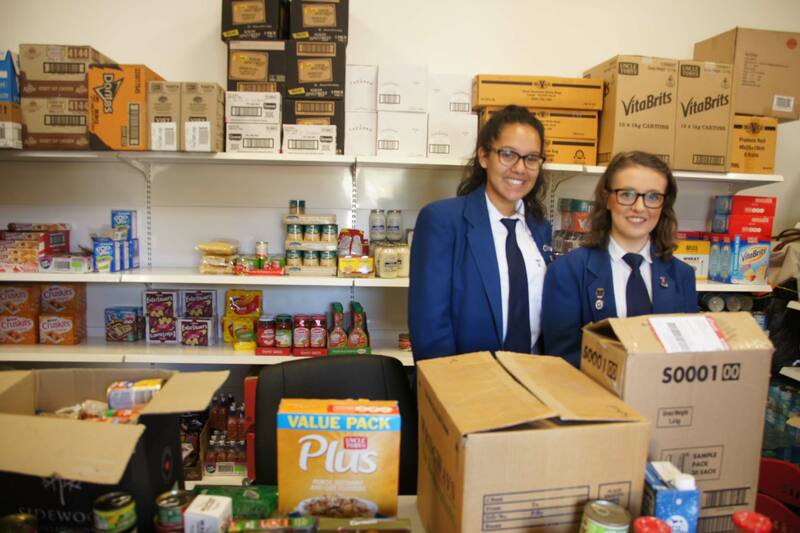 As a part of our prayers for the wider community during Worship, students in the Middle and Senior School have been donating non-perishable goods for those in need. On Thursday 18 May, Laila Moodley (College Captain) and Khayla Weber (Worship Planning Team), made our first delivery with Mrs Johnson and Ms Robertson to UnitingCare Salisbury. The volunteers and the administrators of the centre were overwhelmed with our community’s generosity. As a part of the visit, we were able to assess which products are in high demand and were shown how UnitingCare supports many families each week. Emergency packs are prepared every week that contains 8-12 Weetbix, 1 x 1L milk, 1-2 cans of Baked Beans, and we saw many of these ready to be distributed. In 2017, if every student brings in just 1 non-perishable item of food when it is their turn for weekly prayers, we can help to feed approximately 600 people. Donations of non-perishable goods are welcome anytime through the front office (marked Attention: Ms Jan Robertson or Mrs Jude Johnson) which can be added to our next delivery. Your generosity DOES make a difference. 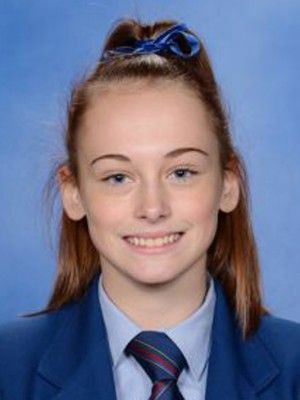 Congratulations to Kate Dewis, Year 10, who won a silver medal in her division of the New Zealand Open Tae Kwon Do Championships recently. Kate competed against an international field of competitors. 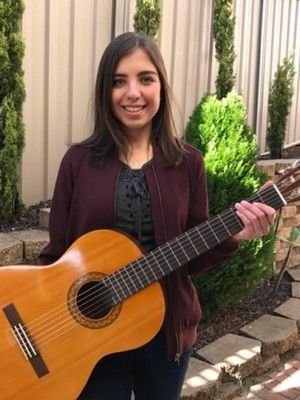 Congratulations to Athena Xiourouppa, Year 11, who has achieved an A with Honours, on her AMEB Classical Guitar Fifth Grade Exam. 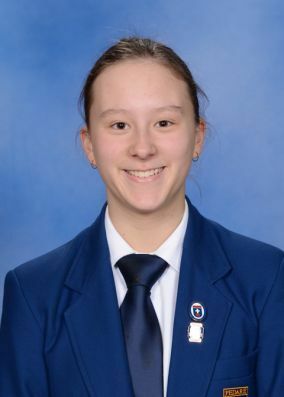 Congratulations to Year 11 students, Sophie Szabo and Amber Roshkov who gained a First and a Second place in the 10th “Chinese Bridge” Chinese Language Proficiency Competition for Secondary School students in South Australia. They have also been invited by Confucius Institute to compete in the Regional Competition in Perth on 15 and 16 June this year. Well done to both girls and good luck for the next competition. 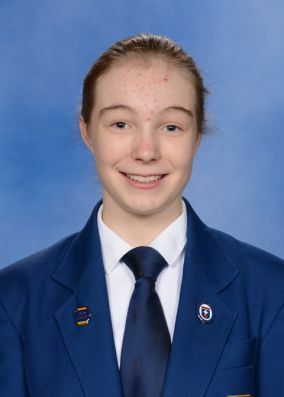 Here’s an update about Julia Blackman, Class of 2015 and member of Pedare’s 90+ Club, who was awarded a scholarship to the Australian Maritime College in Tasmania to study Naval Architecture. 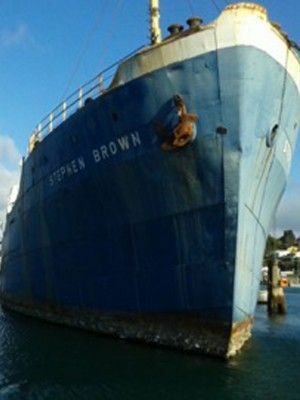 “I am currently in my second year at the Australian Maritime College in Launceston Tasmania, studying a Bachelor of Engineering (Naval Architecture) with Honours. What this means is, at the end of my degree I will be a qualified engineer, specialising in the design of big ships and submarines. My course involves extensive mathematics and physics, but also the study of engines, ships and all their components, with projects such as self-steering robot boats and how to power a boat with a rat trap. I first found out about this field of engineering in Year 11, when I was lucky enough to be selected to take part in a 3-day tour of the university facilities. This involved completing a survival at sea imitation, trying out the ship simulation training facility and spending time out on the university boats along with gaining information about this engineering field. This year, an absolutely beautiful day saw the students running in warm conditions for their races in the SAPSASA TTG District Cross Country. Congratulations to all the students who competed so well on the day. 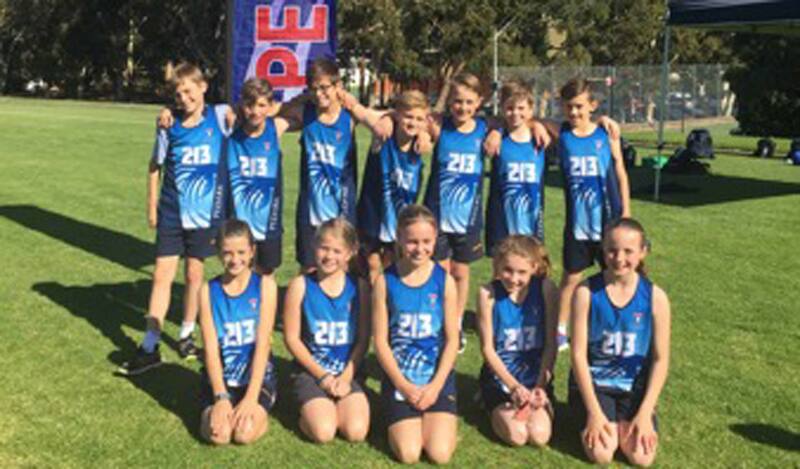 We wish Year 4 students Jamin Field and Tri Nguyen, and Year 5 students Dylan Shephard Bayly, Zack Piercey, Emily Briggs and Kiera Geesing, all the best in their races at Oakbank in the State Cross Country Day where they will be representing the District on June 1. The year 6/7 girls and boys soccer teams recently participated in Knockout soccer. The game on Tuesday 16 May at Tilly Reserve was first for many of the girls on the team who had never played soccer before. They showed courage to come out and play. As the day progressed so did their confidence and ball skills. 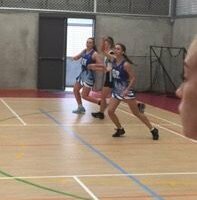 The girls showed determination and worked well as a team winning 1 of the 4 games. Thursday 18 May the girls faced Endeavour College at home where they dominated possession throughout the wet conditions of the game. Two goals were scored in the second half of the game taking them through to the next round of the knockout competition with a 2-0 win. The boys showed their skills and determination in their games on Tuesday 16 May. After a loss in their first game, they worked on their teamwork and passing for a win in the 2nd game and then drew in the 3rd and 4th games of the day. 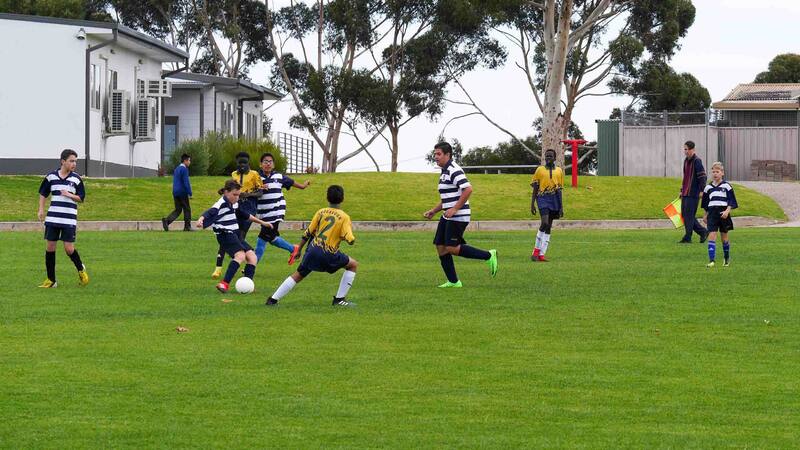 Thursday bought wet weather conditions to the knockout game at home against Endeavour College. The boys fought hard and had lots of shots at the goal which did not find the back of the net. Endeavour College scored late in the game giving them the 2-1 win. 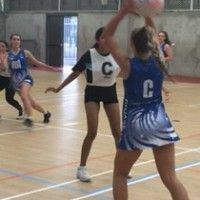 On Monday in Week 4, Pedare Senior Netball girls travelled to Le Fevre High School to play Ocean View and Le Fevre in the first round of KO Netball. The girls played skillfully and the team spirit was high. Our defenders kept the opposition to a low score, whilst our midcourt players made great decisions to feed our goalies who combined well to score heavily in both games. We look forward to our next game! Well done girls, great team effort! This year’s spectacular Middle and Senior School musical production of The Little Mermaid Jr will be held on Wednesday 5 – Friday 7 July at the Golden Grove Arts Centre, Golden Grove. This event will be full of colour, fun, singing, dancing and under the sea frolics. For more information and to book your seats click here. The One+ Careers Expo will be held on Wednesday 14 June at the Golden Grove Recreation and Arts Centre (Arts Theatre and Foyer) from 12:00pm – 8:00pm. The display includes: University Pathways, TAFE Options, Training Providers and Career Pathways. This event is open to students and families from the three schools, Pedare Christian College, Gleeson College and Golden Grove High School, and brings together a wide range of careers advisers with a wealth of information as students make decisions related to a career pathway. The Careers Expo will be open from 12:00pm – 3:15pm to enable students in Personal Learning Plan, Workplace Practices and other subject areas to visit in class groups. The evening session is a good opportunity for parent and family groups to gain insightful information regarding their child’s career pathways. It is also an ideal time for students who engaged during the day session to re-visit. 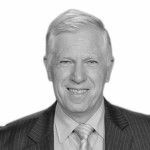 Special guest speaker, Mr Ivan Neville, Labour Market Research and Analysis Branch Manager for the Australian Government Department of Employment in Canberra will be offering useful information to help students make informed career choices. Guest Speaker, Mr Ivan Neville will provide his presentation from 6:00pm – 6:30pm. For more information, contact Mrs Debbie Hollister, Director of Senior Studies & Pathways on 8280 1700. The Journey Church will be hosting a Kids program, ‘Winter Fest’ on Friday 2 June, from 5:00pm – 6:30pm. Cost is $5.00 for one, $8.00 for two or $10.00 for 3 or more children. For more information please contact Renee on 8251 7149. Come and join us. Generators kids club meets Fridays each fortnight for great games, craft and bible time. Our next kids club is on Friday 2nd June from 3:30pm-5:00pm. The activity this week is huge ‘Pet Rocks.’ More information can be downloaded from our website.